The great thing about having Porto as a base is that the surrounding small cities and villages are so accessible by local trains that leave from Porto’s Sao Bento train station. 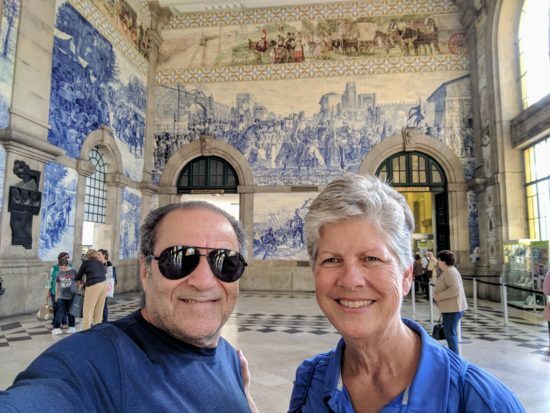 And, it can be said that the train station is a destination in itself and not to be missed because of the stunning tile work, something Portugal is of course famous for. The Sao Bento train station is a destination in itself and the tiles are spectacular. Who are those people?! In no particular hurry that morning, we caught the 11:55 a.m. train bound for Aveiro and we pulled in to the station just a bit more than one hour later. It’s a super easy journey with a wealth of countryside to view as the train rumbles by. It can be noted though that the evening return trains are busy with commuters and university students, but still very manageable. 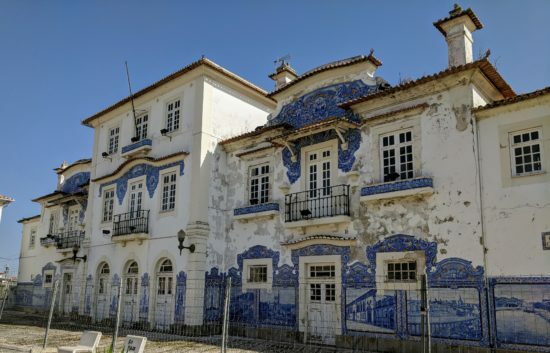 While the trains roll in and out of a sleek modern train station, the historic Aveiro station is right next to the tracks and it boasts the signature blue tile artwork you’ll find at many of Portugal’s historic stations. Take a minute or two to take it in. The architectural design of the white-washed building with the blue tile work against the backdrop of a beautiful clear day was just about picture perfect. If those walls could talk. The historic train station at Aveiro. With a population of about 55,000, Aveiro has a long-established history of fishing, salt making and seaweed harvesting, which if I remember correctly was harvested because it makes a natural fertilizer. 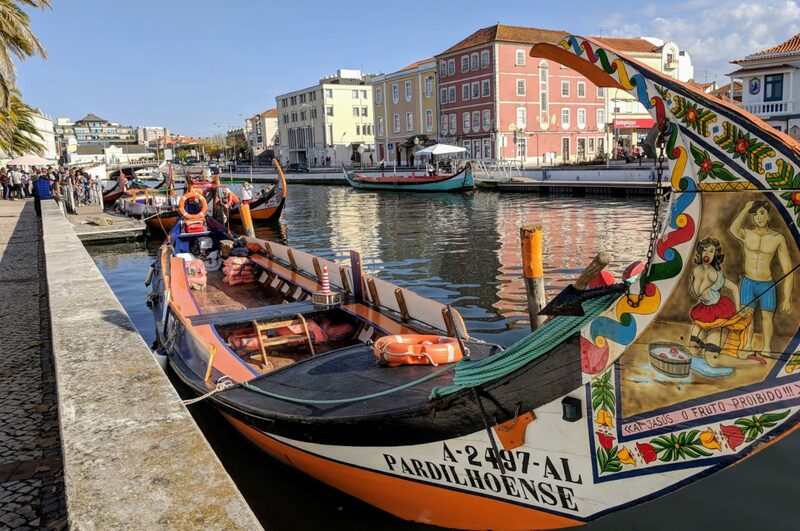 In the middle ages Aveiro was a vital seaport, but over the centuries the silting of the River Vouga and epic storms led to the formation of a sandbar across the river, which in turn led to the eventual decline of seaport industry. 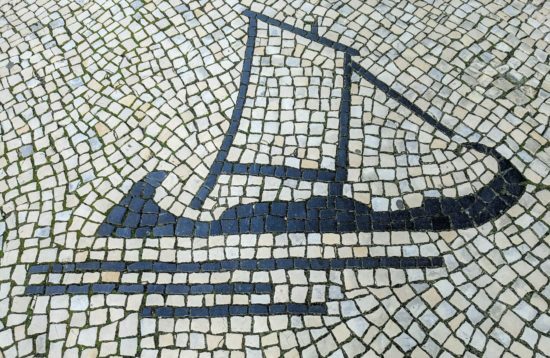 The hand-crafted pedestrian sidewalk tiles (of various designs) depict the history of Aveiro. Although we didn’t get there, visitors can tour the saltpans and the salt making area which is just a short walk from the city center. 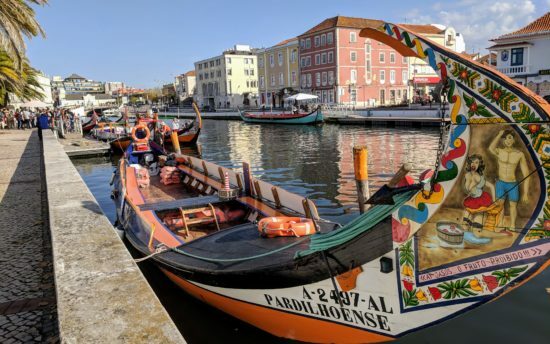 Unique to Aveiro is of course the canals and the gondola-like boats that traverse the canals and transport passengers up and down the canals. We chose to walk, rather than ride, but it did look to be a fun experience albeit fairly touristy. We visited near the end of October so the tourist crowds were minimal, but I can imagine the busyness the summer months must bring. As we walked along the canals we could get up close and personal with the gondolas and the artwork which adorns each boat. This mural did not leave much to the imagination and certainly caused us to look twice! Take a close look at the artwork on this gondola. The historic city center is a labyrinth of narrow cobblestone streets, alleyways and intriguing nooks and crannies. Our favorite way to explore is to just meander letting our feet take us where they may. We’re always on the look out for an enticing bakery with a window display full of deliciousness. 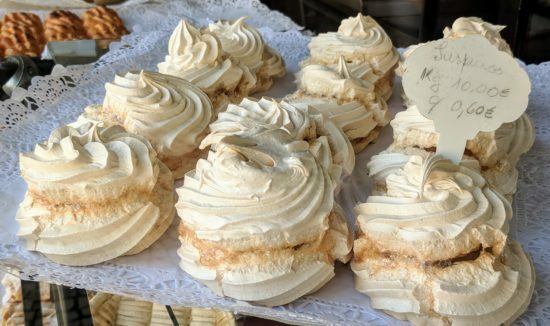 We love meringues and in Aveiro we think we found probably the best we’ve ever had. I think we bought four and later regretted that we didn’t buy more to take with us. It was a delicious discovery even though I was pretty sure I’d never escape the trickiness of the bakery’s bathroom door. Possibly the best meringues we’ve ever had. And, don’t even get me started on our lunch experience at Ferro Restaurante. As we meandered the streets we came across Ferro and saw a lovely little outside table for two. Not only was the food amazing, and the sangria refreshing, our server was beyond personable. 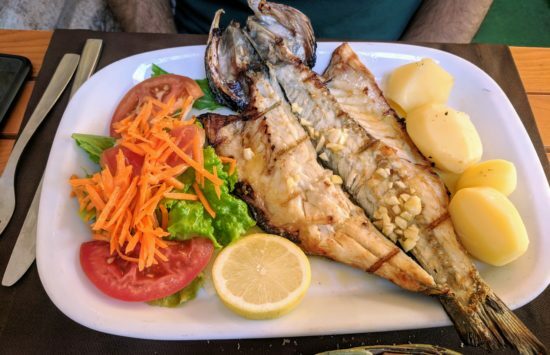 Grilled sea bass with fresh garlic for Abi. 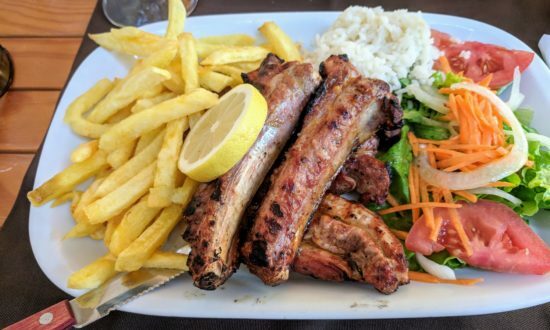 Grilled pork ribs with fries. So, so yummy. We’re still talking about that lunch and while the pictures don’t do the food justice, the food was so good that even though we were stuffed, we very nearly licked the plates. Our lunch was such a nice experience. And, yes, we ate the meringues after our lunch. The hospitality of the Portuguese is brilliant and it always leaves us wanting more. It’s just one of the primary reasons we keep heading back across the pond and why we maintain our temporary Portuguese residency. What’s not to love? From the train station walk straight toward the ocean and cross over the round-about bridge to reach the historic center. Wish we had more time to spend in Portugal last year. Lisbon, Coimbra and Porto gave us just a taste (literally in Porto) of the Country. Thanks for the lovely pictures and commentary. Thank you, Steve. 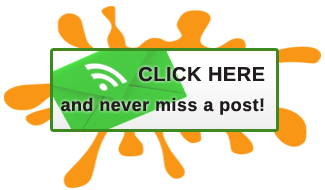 I’m glad you enjoyed the post. Porto is our favorite base in Portugal, it’s such a wonderful city. There are so many beautiful places to explore in Portugal. I hope you get the chance to return soon. That is one fancy train station! Riding the canals looks like fun, but walking the streets lets you see more. And the food looks to die for. Desert first because you can. The historic train stations in Portugal are all classic, and so beautiful even if they’re in a state of disrepair. The tile work is amazing. 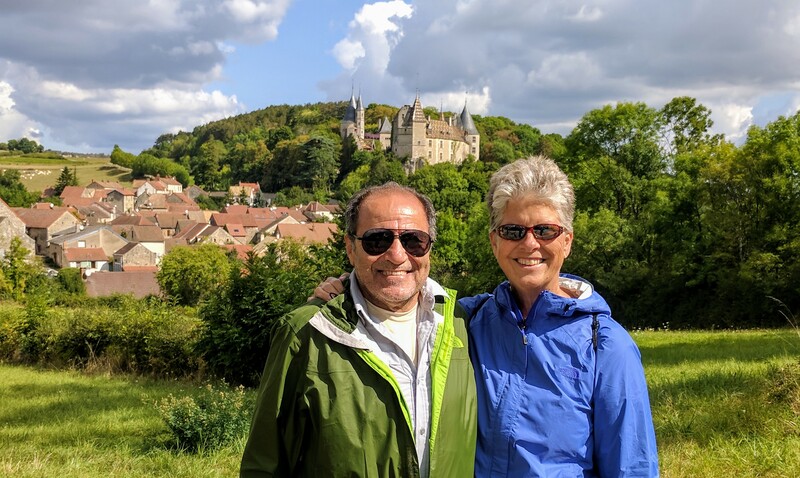 You’re so right about Portugal’s generous hospitality, Patti, and the feeling of warmth and friendliness from the people who live there is contagious. Even though I’ve lived here over three years, I have much of Portugal left to explore and 2019 is the year I plan to travel through many of it’s lovely cities and countryside and take my time discovering some of these places for myself. 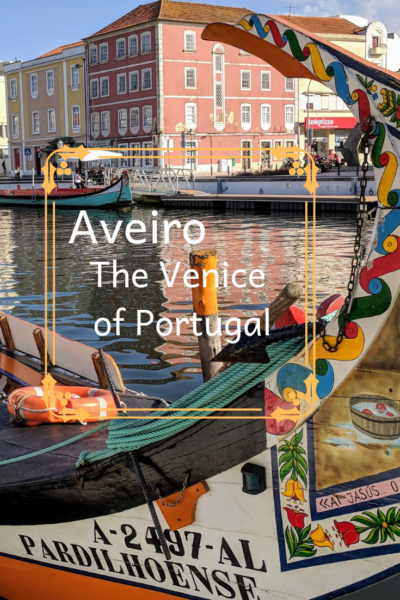 Your photos of Aveiro are lovely and make me want to get started on my way even sooner than planned! 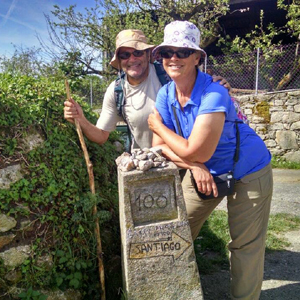 Anita ~ You will love exploring all of the charming little historic cities of Portugal. I look forward to seeing where your explorations lead you. Very colourful place Patti. I especially like that train station – wow! That’s a very interesting drawing on the front of the boat. I thought the woman had an apple in her mouth. The train station was fantastic, Frank, really sorry it was closed up tight. The Portuguese tile work never disappoints! And, yes, the boats were quite something to see in more ways that one!